A beautiful Nature Reserve and archeological site. 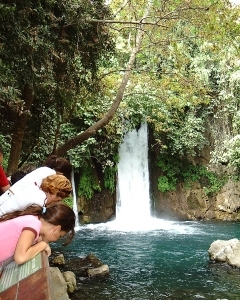 The Banias springs begin at the foot of Mount Hermon where the water rushes with great force though a canyon-like channel, losing 190 meters in altitude over the course of 3.5 kilometers to form the Banias waterfall, one of the most beautiful in Israel. Nine kilometers further, the Hermon River meets the Dan River and the two flow into the Jordan River at an altitude of 80 meters above sea level. The drainage basin of Nahal Hermon covers an area of about 150 square kilometers. This includes the northern part of the Golan Heights and the mountainous area of Mt. Hermon inside Israel. Nahal Hermon’s principal tributaries are Nahal Sa’ar, Nahal Si’on and Nahal Govta. Nahal Hermon cuts through the lower western tip of Nimrod Fortress mountain range and races along a steep river bed. 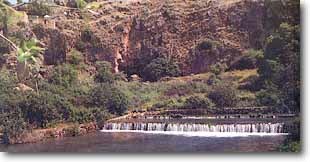 The Nahal Hermon canyon has rapids and waterfalls, the most elevated from a height of 10 meters. Nahal Hermon flows year-round and its annual rate of supply is approximately 125 million cubic meters of water. In the rainy winter months it is swollen by flood water from the mountain tributaries running into it. The river bed is lined by varied and dense vegetation. Plane trees, willows and poplars grow along the waterline on both banks. There are also trees which were planted there intentionally, including fig, citrus, walnut, eucalyptus, matgosa date palm and mulberry trees. The vegetation found higher up is different. Kermes oak, terebinth, Mt. Tabor oak, storax, calycotome and laurel – trees typical of a Mediterranean scrub forest – can all be seen on the slopes. Seasonal plants and flowers found in the reserve are hyacinth & squill, (February – April). Every nook and cranny is filled with lush cliff vegetation. Navelworth, pellitory, ferns (including rock fern and scale fern), as well as ricotia and a variety of other spring flowers flourish there. In the fall, one finds the small-leaved pancartium, the crocus and the autumn crocus flower. Burweed grows in the pools. Sometimes, rock hyrax can be found, lying on the piled-up rocks, and flocks of rock doves nest in depths of caves. You can occasionally spot Neumayer’s Rock Nuthatch, which flies from Mount Hermon, and black sweet-water snails (melanopsis praemorsa) lie on the floor of pools. The ruined city was known as Dan or Mivzar Dan by the Jews (“the Fort of Dan”; a suggested identification with the biblical Beth-Rehov is uncertain). It stood over a cliff with a grotto dedicated to the Greek god Pan and the nymphs hence the name Panias (Banias being an Arabic corruption). In 198 B.C.E., Antiochus III conquered Palestine from the Ptolemies in victories near this location. Later, the city belonged to the Itureans, from whom it was transferred by Augustus to Herod, who named it Ceasarea in honor of Augustus and to whom he erected a temple there. In his “Wars of the Jews”, Josephus discusses Herod’s temple at Panias, “And when Ceasar had further bestowed upon him another additional country, he built there also a temple of white marble, hard by the fountains of Jordan…”. Philip the Tetrarch (Herod Phillipus), Herod’s son, developed the city, resided there, and struck coins with images of its buildings. It was generally known as Caesarea Phillippi, to distinguish it from the better-known Ceasarea-by-the-Sea, but the area continued to be known as Panias. It is mentioned in the New Testament as Caesarea Phillippi (Matt. 16:13; Mark 8:27). In 61 C.E., Agrippa II renamed it Neronias in honor of the emperor Nero, but it kept this name only until 68. In 70, Titus held games there to celebrate his victory and many Jewish captives were put to death. In the Talmud, Caesarea Phillippi is called Keissariyyon (Little Caesarea); the Mishnah also mentions the cave of Pamias, referring to the same place. A statue of Hadrian which stood there was regarded by the early Christians as representing Jesus healing a women. The Talmud refers to the Emperor Diocletian’s oppression of the people of Panias. In Roman-Byzantine times, Caesarea belonged to Phoenicia; its bishops took part in Church Councils from 325 to 451. In Crusader times, it was called Belinas and a strong castle (Qal’at al-Subayba) was erected above it. Since Banias was situated on the main road from Palestine to Damascus, it served as an administrative center to a district with the same name in the Middle Ages. During the 11th century, there was a relatively large Jewish community, whose members were called the Baniasites. They were frequently mentioned in *Geniza documents. A document of 1056 shows that the Banias community was well organized and had a **Bet Din. Since Babylonian Jews had also settled in Banias, the community split into Palestinians and Babylonians, who differed in their version of prayers. These two sections existed through to the beginning of the 12th century. A Karaite pseudo-messiah is reported in 1102; however Benjamin of Tudela mentions no community in Banias in 1170 and it is possible that it had ceased to exist during the Crusades. Later, Banias was re-inhabited by Jews. Even during the early Ottoman period, Jews still lived at Banias, as attested by a document from 1624 which mentions the murder of a Jewish physician, by the name of Elijah ha-Kohen of Banias, by an Arab sheikh. From 1948 to 1967, Banias served the Syrians as a base for attacks on Kibbutz Dan. In June 1967, it was occupied by the Israel Defense Force. *The Fustat (Old Cairo) archive with documents and scriptures from the Middle Ages. Long ago, the spring actually bubbled from the cave itself. 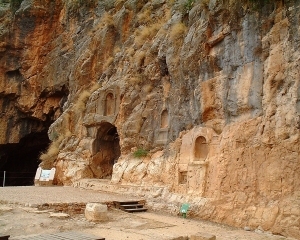 The five niches hewn in the nearby cliff are the relics of a temple to the Greek god Pan. Inscriptions were carved to Echo, the mountain nymph; Diopan, the god who loved music; and Galerius, priest to Pan. The Banias cave is about 15 meters high and 20 meters wide and water sometimes collects on the floor. Outside the cave are the remains of a temple build by Herod. Beyond the modern bridge under the Banias-Kiryat Shemona road, you reach an ancient bridge which arches over the junction of Nahal Govta and Nahal Hermon. This bridge was built during the Roman period from large chiseled stones. The interior is covered with travertine, chalky spring water deposits. Exquisite small stalactites of travertine hang from the roof. A hydroelectric plant once provided electricity to the Banias Druze village. The only water-powered flour mill still-operative in Israel. 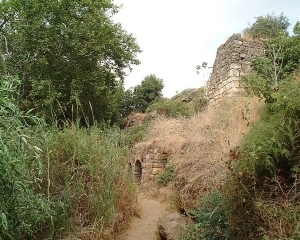 An aqueduct carries water from Nahal Hermon to the roof of the mill. From the edge of the aqueduct, the water drops down a stone “chimney” and, as it falls, it turns three driving wheels attached to millstones. 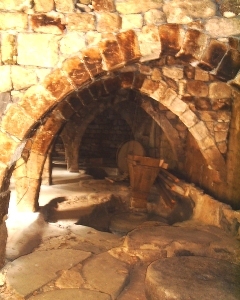 Today, two of the wheels are still in use; the third, which was used to press olives, is no longer operational. The residents of Massadeh and Ein Kinia, nearby villages, grind their grain at Matruf Mill. A bakery was built alongside the mill, and the mother of the family who runs the mill demonstrates how she bakes large pita bread. Originally a large mill, today the only remnants are the driving wheel chambers, the floor of the milling room, with the millstones and the waterfall “chimney” which powered it. On the remaining walls, you can see the extensive secondary use of large hewn stones and sections from Roman and crusader pillars. Ein Khilo’s water is warmer than the Banias, so the Syrian officers who served in the area and wanted to bathe there built a concrete pool to catch the warm spring water. The bubbles rising from the pool floor indicate the origins of Ein Khilo.